Nanna Ditzel was born in Copenhagen in 1923. She began training as a cabinetmaker and then went on to study at the School of Arts and Crafts and the Royal Academy of Fine Arts in Copenhagen. She trained in furniture design, completing her studies in 1946. She is considered one of the 20th century’s leading furniture and jewellery designers. 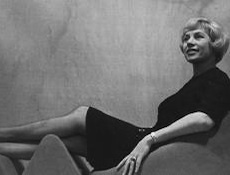 Most prolific during the post-World War II time period known as the golden age of Danish design, she worked alongside some of the greatest names in Scandinavian design. From the early days of her career, her innovation set her apart from other furniture designers. She explored different materials including fibreglass, wickerwork and foam rubber and found it impossible to limit herself by discipline, preferring instead to dabble in such diverse specialties as cabinet-making, jewellery, tableware, applied art and textiles. Ditzel’s collaboration with Georg Jensen spanned a half a century and led to the production of over 150 works for the company, mostly in the field of jewellery design. Nanna Ditzel’s unceasing innovation in the uses of silver and gold has, during the course of five decades, resulted in jewellery with its own unique modern idiom–this idiom has come to represent Georg Jensen’s unique design language.